In the wonderful world of construction, safety for the workers is always top of the mind and made possible with trench boxes. Doing the job safe is just as important as doing the job correctly. Trench boxes correctly adds to the overall success of workplace safety. Being safe is easy to do and can be achieved. One of the problems is that trench boxes are costly and as a result there aren’t always enough of them to go around. When this happens and no box can be found shoring is not safe and is an impossible task to achieve. 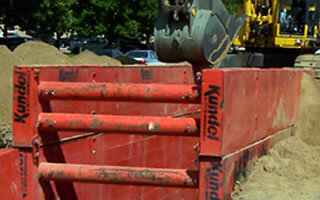 Many construction companies make a choice to purchase trench shoring boxes outright. Because of the high retail cost this is not always possible. As a company you can also rent this trench shoring equipment if that is better for you. Our company is willing to do both, we will sell you the equipment outright or we will rent it to you at a cost effective pricing option. We understand that you need to get your job done and we want you to keep everyone on the job safe by using this important trench shoring box equipment. We thought long and hard about what we could do to keep people safe on construction sites and we came down to one thought, find a way to provide the equipment you need at affordable pricing. To that extent we secured both new and used aluminum shoring boxes and are offering them for sale and rent. We know this equipment is not cheap but, we understand it’s importance. We have even come up with options for you to rent to own the equipment you need. We offer financing and affordable shipping rates. Because we ship to you anywhere in the United States and Canada, we can get you the boxes you need, when you need them. Since we have a great understanding of this industry, we know sometimes you need a steel shoring box and sometime you want an aluminum shoring box, so we offer both. We know that there are a small construction truck full of places where you can buy boxes, so, why should you do business with us? Well, all of the reasons we have outlined are great reasons. We have the selection, we can offer new and used, we can finance, we can ship to you and so much more. Having said that, there are several things that make our company the go to company in our industry. First, we sell to people, not companies. We care about you and your work force. We want you to stay safe and return to your families and friends after the work day is over. We don’t want you to have a lawsuit because you can’t get the equipment you need. We are in the business of helping people. Second, we have everything you need in one place. We are cost effective and can ship the equipment to you. So, give us a call and let’s have a heart to heart talk about how our business can help your business. Previous Previous post: Is This a Shielding or a Trench Shoring Job?